Anvil clouds, which are mostly composed of ice particles, form in the upper parts of thunderstorms. 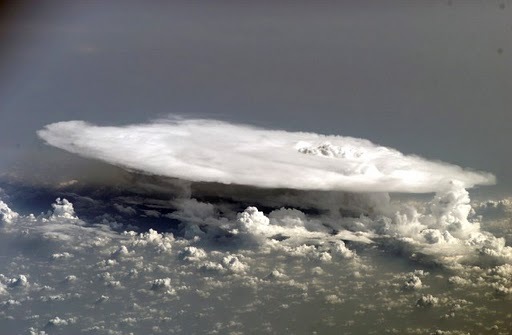 They get their anvil shape from the fact that the rising air in thunderstorms expands and spreads out as the air bumps up against the bottom of the stratosphere. This is because the air in the stratosphere is warmer than the rising air in the anvil, and so prevents the relatively cooler anvil air from rising any farther. You will often see streaks of snow called "virga" falling out of the edges of anvils. This virga evaporates as it falls through the relatively dry air surrounding the upper part of the thunderstorm. A SNOWSTORM IN SUMMER?Because the upper layers of the troposphere are so cold, anvil clouds often contain heavy snow, which melts as it falls into warmer air below, turning to rain. It is extimated that about 50% of the rain produced by the average thunderstorm originates as ice and snow, even in the tropics.